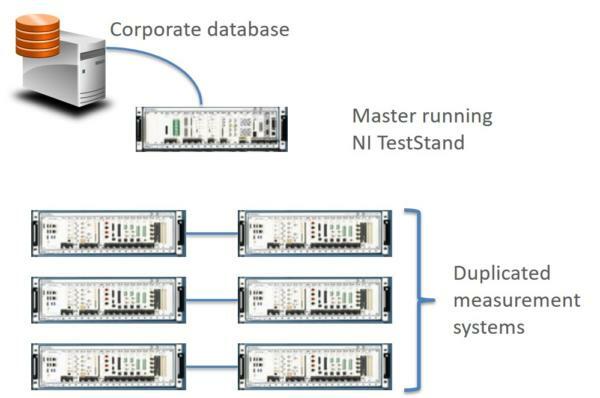 LabVIEW PXI Solutions – Need a PXI-based test system? With over 1,500 PXI-based systems under our belt, we’ve utilized PXI for numerous manufacturing test and product validation applications. 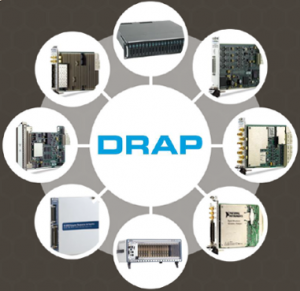 The broad range of off-the-shelf expansion cards and processing horsepower make PXI-based test systems a formidable choice for many automated test applications. 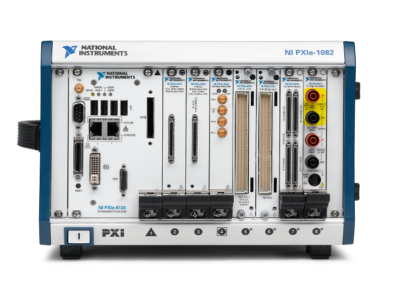 NI’s PXI platform is great for systems that require the wide range of test instruments that PXI supports, or that need the processing power of a PXI controller. PXI data acquisition hardware is capable of handling 1000s of digital and analog I/O. 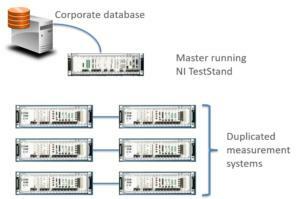 PXI test systems can process massive amounts of data with the latest CPUs or with some of the largest Xilinx FPGAs. Need a PXI-based solution? Chat with a PXI Developer. Whether you’re looking for a turnkey solution or just want some help with a piece of your application, our PXI developers are here to help you. The initial interface/test system to the DUT was up and running and getting real data from the DUT in ~2 weeks, allowing the customer to maintain a tight development schedule. Our client was developing an image sensor component and needed to validate the part for a new product line. They wanted to use as much COTs hardware as possible to start testing as soon as possible. The custom product validation test equipment utilizes the NI PXI with FlexRIO off-the-shelf hardware combined with custom LabVIEW-based software. Packet Decode completed at FPGA Level allowed error handling and only pertinent data being saved as needed. Data Manipulation done at FPGA level for unbundling data into correct disk readable format in real-time. 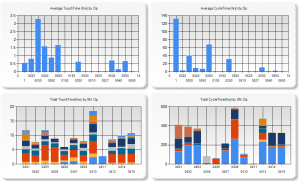 All Data captured with TDMS Files to disk enables a higher level of analysis of the data offline. 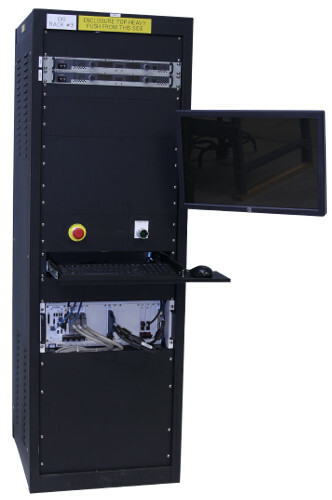 The new PXI-based automated test system utilizes NI’s FlexRIO with NI stock LVDS FAM. Custom VHDL was created to handle the required adjustable delay lines in the data I/O lines and interface to the I/O on the FAM Connector. The VHDL interfaced to LabVIEW FPGA which was utilized to stream the data to disk. Data is stored onto disk during a test and only the payload data from decoding the protocol is saved. The data coming from the UUT is de-packetized and ordered for manipulation downstream. 100s of man-hours saved in capturing the data. New product development drove the need for validation of a new sub-system (a RADAR sensor ) for use in a next-gen system in an automobile. They needed a way to evaluate and characterize the performance of the component under various conditions that were not defined in the UUTs specs. They wanted to use as much COTS hardware as possible for this first run testing because of the expense of a custom test solution and the timeline. The NI FlexRIO-based product validation system utilizes COTS hardware, along with some Viewpoint-developed custom software to allow for evaluation and characterization of the UUT. The utilization of COTs (vs a custom-built FPGA board) test hardware. Allowed customer to manipulate captured data within the LabVIEW environment for more efficient testing, making changes on the fly. Packet Decode completed at FPGA Level allows for real-time de-packetization for use in storing only payload data. All Data captured with TDMS Files for use in over layering different scenarios. Scalable to add additional serial data channels allowing for more than one sensor to be captured with a single FlexRIO card. NI’s FlexRIO with NI’s LVDS FAM was used. The NI flying lead cable was utilized initially to connect to the UUT. On the software side custom VHDL was created to handle the 8b/10b serial stream data and clock recovery. The VHDL interfaced to LabVIEW FPGA which was utilized to stream the data to disk on the PXI-based system. Our client already had a test system in place, but the tester (really two test systems testing two different product variants) was becoming obsolete. The tester was old, hardware was failing, and it was getting harder and harder to keep it reliably running. They wanted a new tester to improve reliability, but maintain the functionality of the existing tester to keep the FDA-mandated verification and validation time to a minimum. The updated end-of-line manufacturing test system maintains the functionality of the old test systems, but with updated hardware and software. The same software is utilized for both the manual test system update and the automated test system update. Our client deployed 6 manual testers and 1 automated tester. There were two variants of the new test system. One was for an older product line that utilized manual test, with an operator that connected/disconnected the UUT, and initiated the test. The other was an automated tester, integrated into a manufacturing machine. Both testers utilized custom fixtures (provided by the client), off-the-shelf NI measurement hardware (selected by Viewpoint), and custom test software (developed by Viewpoint). The software is configurable for both the manual test system and the automated test system. 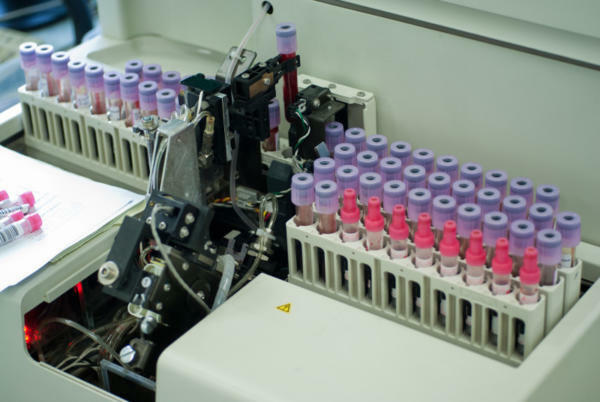 Our client was embarking on a complete redesign of their flagship automated in-vitro Class 1 blood diagnostic machine. In order to meet schedule goals, the design and build of several automated test systems needed to occur in parallel with the overall machine. In a major design paradigm shift, many components of the machine were being manufactured as modular subassemblies, every one of which was an electro-mechanical device. Thus, multiple testers were required to test each of the specific subassemblies in the machine. 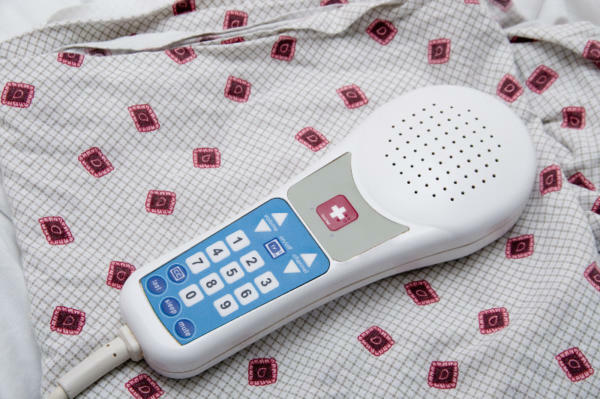 And, since this was a medical device, the testers needed to comply to 21 CFR Part 820 and Part 11. With a looming deadline, the testers needed a common architecture, so that all testers could leverage the development from the others. Since each subassembly could be tested independently of the overall machine prior to final assembly, the design of the testers was based on a common measurement and reporting architecture, written in LabVIEW, that interfaced to the customers Part 11 compliant database for testing procedures and measurement results. Furthermore, procedures and validation checks for calibration of the testers were part of the overall test architecture. Modular and common software developed for the test systems reduced the V&V effort during IQ & OQ. Since multiple subassemblies were being tested, with one part-specific test system per part, the automated test systems used as much common hardware as possible to simplify the development effort through common hardware drivers and test steps. Measurements were made with PXI equipment. Test steps and the test executive that executed the test sequence(s) were developed using LabVIEW. 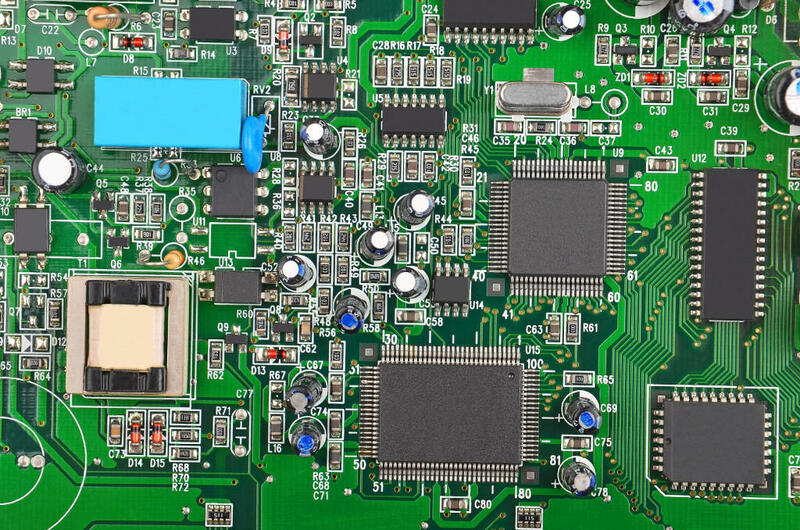 The types of test steps required to verify the proper operation of each subassembly were categorized into basic operations, such as voltage reading, pulse counting, temperature reading, and communications with on-board microcontrollers. The specifics of each measurement could be configured for each of these measurement types so that each test step accommodated the needs of the specifics of each subassembly. For example, one subassembly might have needed to run the pulse counting for 2 seconds to accumulate enough pulses for accurate RPM calculation while another subassembly might have only needed 0.5 seconds to accomplish that calculation. The configuration of a test step algorithm was accomplished via an XML description. The accumulation of these XML descriptions of each test step defined the test sequence run on that specific subassembly. Test results were associated with these test sequences by completing the entries initially left blank in the test sequence, so that all results were explicitly bound to the test sequence. 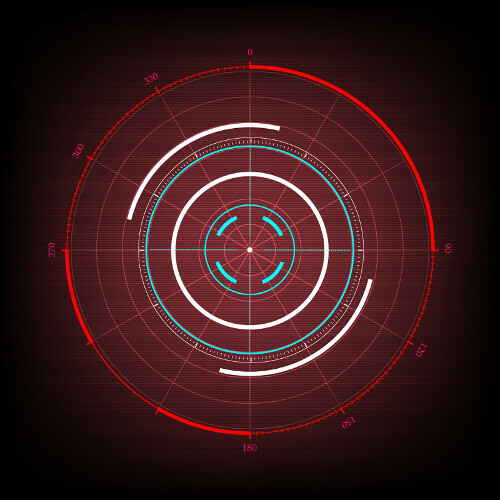 The operator user interface distinguished between released and unreleased test sequences. With unreleased test sequences, engineers could try the most recent subassembly designs without needing to wait for final validation. The released sequences were only available to test operators. This login-driven branching was managed using the Windows login, so that the client employees could use their company badge-driven login process. Once logged in, the user would be able to execute the test sequence in automated mode, where all steps happen automatically, or manual mode, where one step could be operated at a time. Furthermore, the Windows environment was locked down using built-in user account group policies to designate the level at which a user could access Windows or be locked into accessing only the test application. During the V&V effort, each test sequence was verified for expected operation, against both known good and bad parts. Once verified, the sequence was validated against the requirements and, when assured to be as expected, a checksum was applied to the resulting XML test sequence file and all was saved in a Part 11 compliant database. Upon retrieval, when ready to run a test, the sequence was checked against this checksum to assure that a sequence had not been tampered. Test results, saved as XML in the same file format as the test sequence, were also surrounded by a checksum to verify that no tampering had occurred. The IQ/OQ efforts were handled in a traditional manner with the client developing the IQ/OQ documentation, with our assistance, and then executing these procedures, again with our assistance. Automated testing reduces operator man hours and increases production throughput. 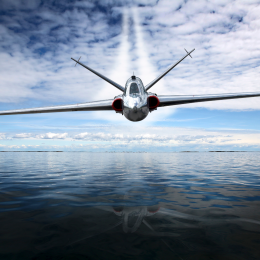 Client – A manufacturer of actuators in the mil-aero industry. New Product Introduction (in this case a new controller and new actuators) drove the need for a new automated electromechanical test stand. 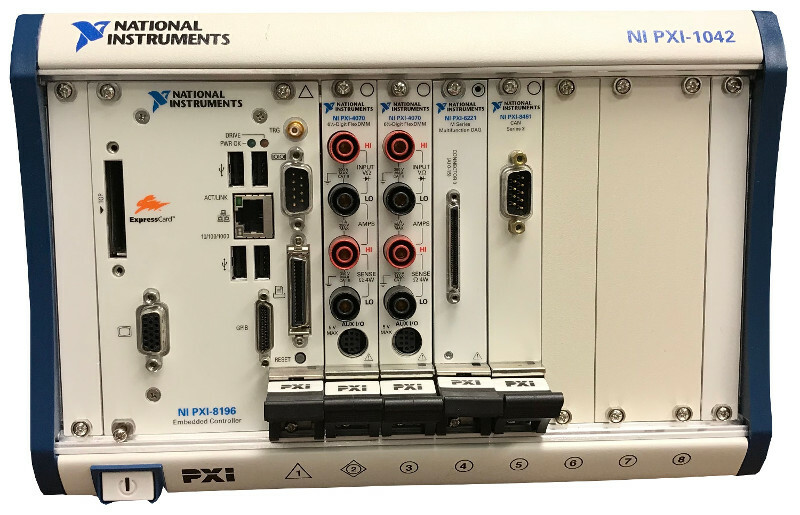 New NI PXI-based electromechanical test equipment provided automated testing, report generation, and SPC data generation. The sequencing of the test procedure, reporting, and verifiable results were managed with the StepWise platform. Meets strict customer requirements regarding testing and data recording in a verifiable manner. Collects data to support SPC (Statistical Process Control). Ability to obtain the internal state of the controller FPGA via the LVDS communication link. Viewpoint developed the software and selected NI data acquisition and control hardware for the test stand. There are several layers of software functionality. The company makes automotive components in very large volume, several part models each at more than 1 million per year. The client’s primary concern was conserving floor space. They were completely out of spare manufacturing space. Viewpoint created an N-up NI PXI-based Manufacturing Test System. In this case, N=6 because analysis showed that a 6-up electronic part tester allowed the test operator to cover the test time with the load/unload time. being able to completely parallelize made the number of extra units per year large enough that the payback time for completely duplicating the measurement instrumentation for each UUT socket was less than about 1 year. Paid for itself in less than 1 year by the enhanced throughput. Part handling was managed by a PLC and robot which delivered the parts from a tray into the UUT sockets. Digital bits were used for signaling the test sequence which parts were present in their sockets and ready to test. Many companies operate in a high-mix, low-volume manufacturing environment. In these situations, production of such parts is often complex, with long assembly and test procedures describing the process to make and verify the part. Discussions of automating any part of these processes are often dismissed because an automated test system is thought to be expensive, especially when each part is thought to need a unique test system. Our client wanted to improve their capability to manage the assembly procedures and get clarity on the status of any parts, whether partially or fully assembled. The existing situation had data manually-entered into a database form or even handwritten data that needed to be transcribed into a database. Often the database was local to the assembly cell. The chance for error was significant and the lag between data collection and updating the database was often days. When questions arose about the status of a particular unit, many hours could be spent in locating and evaluating the associated forms and paperwork. The steps needed to achieve these goals were clear: automate the collection data on each part while being assembled so that those results would appear in a business-level database which would give a plant-wide view of the status of all the parts in progress. 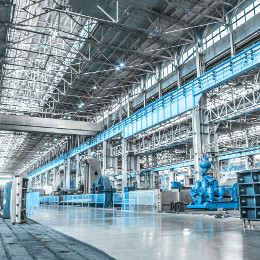 Thus, this project needed to allow read/write access to sections of the Manufacturing Enterprise System (MES) database so that information about a part being assembled could be obtained automatically and results could be submitted to that MES database automatically. We designed the PXI-based system based on the StepWise platform to automate the assembly and testing. This platform enables two significant changes. These changes were made at each assembly cell by having the operator use a test PC and perhaps some measurement equipment as appropriate for the part(s) being assembled at that cell. First, we replaced all the printed assembly procedures with electronic records so that any operator could review the latest version of the work instructions on a computer screen. This approach helped with version control, especially important since the client had various model revisions that came through the factor for rework, each with slightly different versions of assembly instructions. Second, we displayed those electronically documented work procedures as steps in a test executive, allowing the results of each step in the assembly procedure to be captured electronically. When an assembly step was purely manual with no measurements, the fact that step was completed would be recorded, along with information such as the name of the operator performing the step, the duration that the step took, and so on. When a step required a measurement to be made, such as a functionality verification or a calibration result, the measurement would be collected. If the equipment making that measurement could be automated, we would collect that data automatically, and not require the operator to type the result into a computer form. The outcome of this effort has enabled the client to get a snapshot of the status of parts in assembly, i.e., Works in Progress (WIP), quickly and accurately. After these changes were made, many additional capabilities are now available with the advent of purpose-built queries into the appropriate MES database tables. The table below shows the overall efficiency gains achieved. The key is the combination of the electronic test results obtained at the test equipment with information on work orders and manufacturing flow held in the various tables in the business MES database. This improvement happens even with manual or semi-automated test systems, and does not require a completely automated assembly and test system. Thus, the cost of the test system is much less than usually expected and, hence, the benefits are more easily cost-justified. At maximum throughput, the systems needed to consume during record and produce during playback about 800 MB/s/slot. A large company involved in C4ISR was developing a system for a new high-speed digital sensor device. Viewpoint was contracted to build a test system used in design validation and ultimately endurance testing of the sensor. Since the sensor was a component of a larger system which was being developed at the same time, another test system was created to simulate the sensor by feeding signals into the system. Both the amount of data and the frequencies of the various digital signals were nearly at the limit of hardware capabilities. At maximum throughput, the systems needed to consume during record and produce during playback about 800 MB/s/slot. The FPGA clock on the FlexRIO had to run up to 300 MHz. The skew between triggers for data transmission needed to be less than 5 ns even between multiple FlexRIO cards even when the parallel data paths has inherent skews associated with the sensor. Finally, the systems needed to handle clocks that might be out-of-phase. Achieving these requirements required significant engineering design in the face of multiple possible roadblocks, any one of which could have eliminated a successful outcome. Furthermore, as usual, the development timeline was tight. In this case, it was a very tight 3 months. This sensor had several parallel data paths of clock and data lines with clock speeds up to 300 MHz on each path requiring exacting design and build of a custom FlexRIO Adapter Module (FAM) and unique custom CLIP nodes for extending the FlexRIO FPGA capabilities. The FAM also had a special connector for interfacing to the customer’s hardware. Additional NI hardware and software completed the system components. The host application, written in LabVIEW, managed the configuration of the data acquisition and the control of the LabVIEW RT-based FlexRIO systems. The configuration primarily dealt with the number of sensor channels in use, skew settings between digital lines, and other parameters that dealt with the organization of the data passed between the sensor and the FlexRIO. Two FlexRIO applications were written, one for record and one for playback. Each FlexRIO application was written in LabVIEW, and managed the configuration of the FlexRIO cards and the movement of data between the FlexRIO cards and the RAID drives. Note that Windows supported for the RAID driver. Between 10 and 32 DMA channels were used for streaming, depending on the number of sensor channels being used. And, each FlexRIO application had an FPGA layer, written in LabVIEW FPGA enhanced with custom CLIP nodes. For the record application, we developed a custom DRAM FIFO on the FPGA to assist with the latencies on the PXIe bus. For the playback application, we were able to stream directly from DRAM. The FlexRIO and stock FAMs from NI were initially considered as candidates for this project. Clearly, working with commercial-off-the-shelf (COTS) components would be most effective. Three options were available at the project start which could accommodate the required clock frequencies, but none offered both the required channel counts and skew/routing limitations. Hence, we had to design a custom FAM. This decision, made before the start of the project, turned out to be wise in hindsight because the parallel development path resulted in some shifts of sensor requirements which could be accommodated with the custom FAM but might have led to a dead-end with a COTS FAM. Essentially, the FPGA design had a majority of FPGA code developed in LabVIEW FPGA and we used CLIP Nodes for interfacing the signals between the FlexRIO and the FAM. 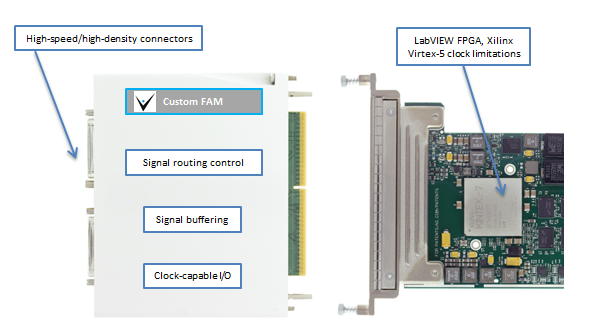 As mentioned earlier, we had to create a custom FAM because of the need to route high speed signals from customer-specific high density connectors while synchronizing signals across multiple data channels and FPGA modules to within one (300 MHz) clock cycle. At these high-speeds, the FAM needed careful buffering and impedance matching both on the signals as well internal components on the FAM PCB. At the start of the design, we utilized Mentor Graphics HyperLynx High Speed DDR signaling Simulation software to minimize signal reflections prior to building actual hardware. This step saved countless hours in spinning physical hardware designs. We designed the FAM to allow channel routing and access to additional clock and trigger pins on the Xilinx chip and PXIe backplane. The choice to base these digital record and playback systems on NI hardware and software was critical to completing this project. The open architecture in both hardware (custom FAM) and software (CLIP Nodes) enabled us to include some very creative extensions to the base toolset without which the project would not have succeeded in the allotted pressured schedule and on a predetermined budget. We were able to stretch the capabilities of the hardware and software very close to their maximum specifications by combining COTS and custom much more cost effectively than a purely custom design. 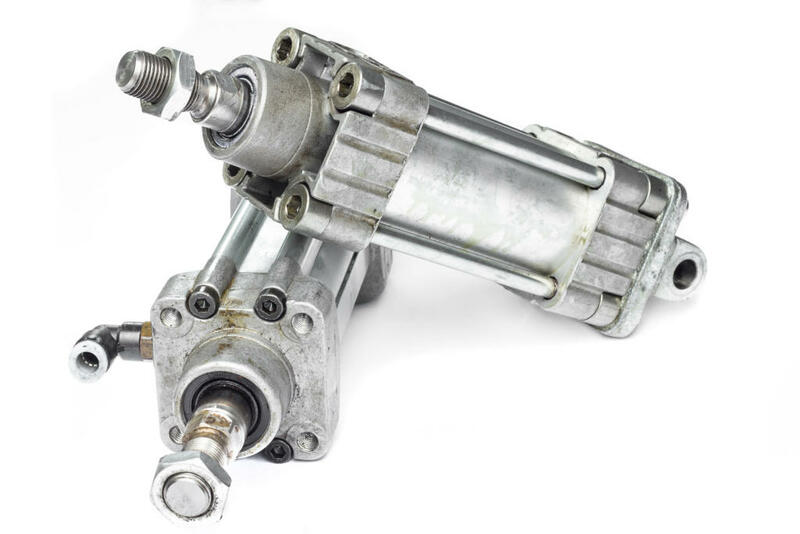 A manufacturer of components for both commercial and military aircraft built a large number of different models of servo valves. Some models were made only a few times each year, while other models were made with an order of magnitude higher volume. Each unit underwent rigorous testing during and after assembly. Our client needed to submit the results of that testing to their customers but since the production and testing of each unit happened in many locations, possibly even around the world, many hours were spent locating the appropriate datasets and assembling the report. Furthermore, our client wanted to improve their responsiveness to requests from their customers by having rapid retrieval of the test report for any part after it had been delivered into the field. 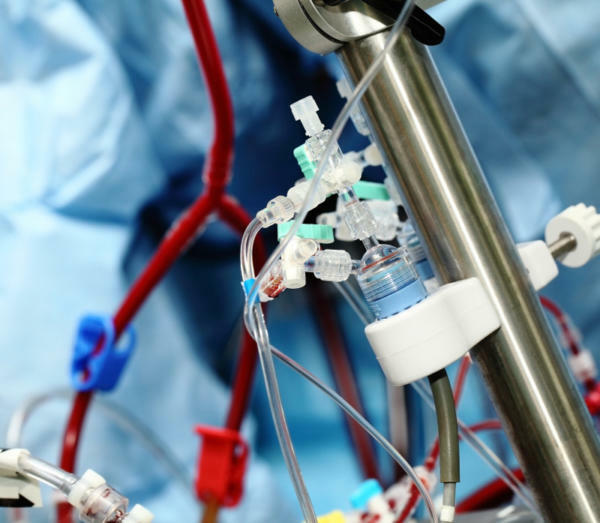 Since the test datasets were varied due to the large numbers of different valve models and associated test procedures, a database was created using a platform based on the Resource Description Framework (RDF). An RDF database can accept arbitrary types of data, manage that data through metadata tags, and adjust gracefully to changes in content and shape of the connections between objects in the database. This adaptability was key to our client being able to leap past some of the issues in standard SQL-based relational databases. The results from each test run on each part at each (PXI-based) test system were tagged with metadata and pushed into the RDF database. The StepWise platform interfaced to the RDF database by outputting XML content which was scanned by a routine created for the RDF database and converted into the RDF data and links. The part ID was a critical tag since this allowed searching the RDF database for all results associated with that specific part. This database resided on a server at the client’s headquarters and accepted data from worldwide locations. Once the data for each part was housed in the database, a report could be generated. To accommodate the variety of data in that report, web technology was used to render the report pages based on the types of data entered into the database, as described by the metadata tags. For example, data identified as waveforms could be plotted or listed in tabular format. Having reports rendered based on the data types made it possible to handle adjustments to the types of data measured by the test system. With the ability to render reports quickly, our client could produce detailed reports for their customers indicating the performance of any specific requested servo valve. Our client was able to trim the time to create reports to less than 1 day from the previous effort of 3-5 days and with less error. Data are now organized uniformly, simplifying the location of desired information, as compared with files stored on various test PCs and file servers. The client has the ability to generate automatic emails to their customers with the required reports already attached and ready to go. In potential warranty and customer service situations, having the ability to send the customer a report within hours represented great customer service. All these features are available consistently across worldwide manufacturing facilities, reducing training and maintenance of procedures. And, of course, the reports handle using metric or English units as appropriate for the end customer. A major manufacturer of aircraft landing equipment needed to develop a means of endurance and fatigue testing new designs for aircraft steering. 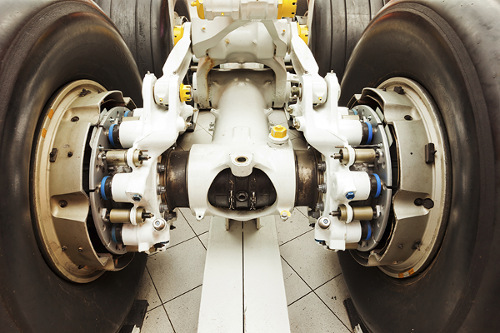 The actuators involved in steering the nose landing gear (NLG) required precise and reliable control through thousands of steering cycles. Control loops needed to be closed at faster than 1 ms. Prior systems were handled manually without real-time control and monitoring. Our customer designed and built a test rig to provide the hydraulics and environmental conditions for the endurance testing on the NLG. 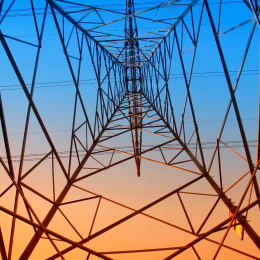 Viewpoint Systems supplied the electronic data acquisition and control hardware coupled with real-time software to provide the required fast control loops. The configuration and execution of the 1000s of steering cycles were managed by the same data acquisition and control system through a set of configuration screens that allowed specification of turn rates, min/max angles, drive and resistive torque settings, and so on. The various PID control loop configurations were also configurable along with gain scheduling required under different operating conditions. The environmental conditions were supported by controlling a temperature chamber through ramp and soak settings occurring during the steering tests. Measurements on the steering performance were collected from commanded setpoints, sensor readings, and controller outputs during the entire test run. 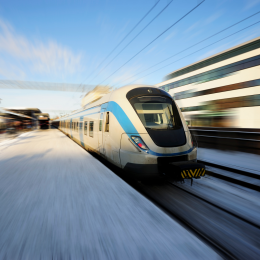 Alarm and fault conditions, such as force exceedance, were monitored continuously during operation so that the system could safely run unattended. The entire system underwent an extremely rigorous acceptance testing procedure to verify proper and safe operation. Prior to deployment of our system, setup of a test was much more manual and operators needed to be around to monitor operation. With our new system, complete endurance testing could be specified and executed with minimal supervision. Furthermore, the tight integration of real-time control and coordinated data collection made report creation much simpler than before. 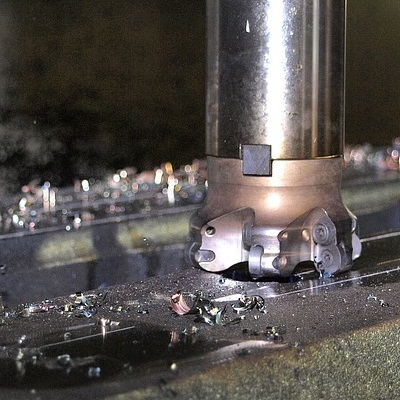 The rigorous acceptance test gave trustworthiness to the data and allowed the design engineers to validate performance more quickly than the prior semi-automatic and manual methods of operation. Setup of tests has been improved from prior operations. The endurance testing itself operated over a huge number of cycles lasting weeks to months between scheduled lubrication and maintenance. The deployed system measures performance during the entire testing, even between the scheduled downtime. Client: A large high-tech R&D-oriented company. We utilized off-the-shelf hardware combined with custom software and had a working system after ~7 man-weeks of effort. The DRAP system records and plays back digital data only, with A/D conversion being handled by the DUT. 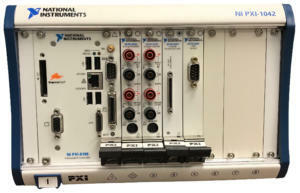 The system was developed on the National Instruments PXI Express platform. A RAID array of disks is used to continuously record data. Data manipulation is performed on a Xilinx Kintex-7 FPGA that forms the basis of a National Instruments High Speed Serial board. 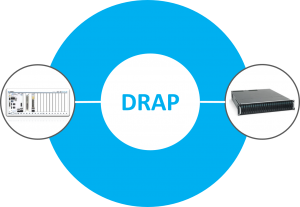 The DRAP system is connected to the RF receiver using standard SFP+ connectors. A UI connects to the system locally or over Ethernet to monitor and control DRAP during record/playback. The customer can also control the system via an API so that it can be integrated into a larger test system. Allows for repeatable data through the processing chain. 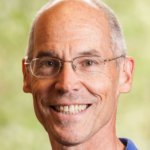 Can re-sample data, inject new headers into data packets, and re-pack new data.